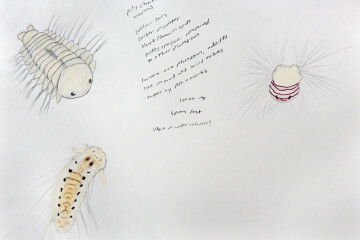 Part of my plan for the larger body of work I want to make based on this cruise is some pieces about the arctic food chain. I want to show how even the biggest arctic animals such as polar bears, walruses, and whales are still completely dependent on the tiny phytoplankton for survival. Today I started drawing walruses in preparation for a larger walrus food chain piece. I use these small studies to learn about walruses and how their bodies look and move so that I will be more familiar with them when I do the large piece. 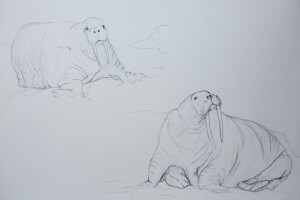 I also use the studies to test out different compositions and walrus poses to get a better idea of what will look good. Drawing from observation requires a really intense level of looking and is a good tool for me to learn about my subjects just by observing every detail so closely. In that way art is a lot like science, l am learning about the world around me through very close, very focused observation of it, I’m just using a different set of tools to record my observations. Chelsea is an artist working on Cape Cod. 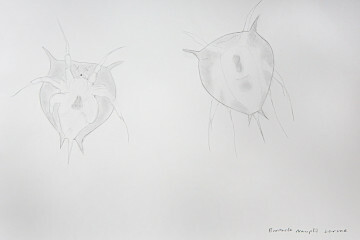 She holds a Bachelor of Fine Arts in Printmaking and Drawing from Maine College of Art. She will be making daily drawings based on her daily experiences while also developing imagery for a larger body of finished prints. I really love how much character these Walruses seem to have! Have you seen many Walruses on the ice? I know that they stay closer to coastal ice, but have you passed large groups on your way further north? Thanks! We did pass a lot of walruses on our way north! No huge groups, but quite a few smaller groups of 3 or 4 at a time lying on the ice floes. We even saw a baby in one group! You’re right about them staying closer to the coast, so now that we’re so far out to sea and so far north in the solid ice we haven’t seen them lately, but I hope we see more on our way back down at the end of the trip. 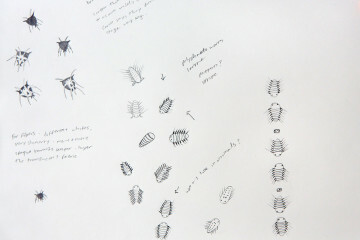 Unless otherwise stated all content is copyright Woods Hole Oceanographic Institution.